Since its release in late January, Baratunde Thurston’s book, “How To Be Black,” has sold more than 15,000 copies, hitting the New York Time bestseller list out of the gate. Thurston, The Onion’s former director of digital, and Craig Cannon, his campaign manager, have employed a slew of creative tactics for selling the book. In a recent interview, Thurston talked with me about what’s worked, what hasn’t, and the secret sauce for their campaign. Before you dive in, I’ll note that Thurston — in addition to having written a terrific book — has a gift for making people feel like they want to be part of his world. Although I’d read excerpts of the book early on, as he included them in his email newsletter, and although I was given both an electronic and a print copy of the book, I still bought it, just to support him. How can you make that magic happen for your book? Read on. Any sales numbers we can share for context? Baratunde Thurston: We went into this with a goal of significant pre-sales to hit the New York Times bestseller list. How many does it take to do that? Anywhere from 1,000 to 100,000 in sales, and it depends on what else has come out that week. The pre-sales all accrue to one week, so you can stack the deck. We had 20,000 pre-sales as a goal. That was insane. We wound up with several hundred pre-sales, which was helpful, but not a juggernaut. We hit the list at No. 21. Mostly, that was useful because The Times had me do a joint interview with Charles Murray that ran in print and online during Black History Month. And that drew some attention. What we learned from this is that people do not buy books. They like to talk about books. They like to talk about buying them. But they do not buy them. Also for context, how important are book sales for you? Baratunde Thurston: Sales are important. I want people to read the book. I want them to spend money. This wasn’t a vanity publishing project, but it wasn’t a get-rich scheme, either. It was a way for me as a creative person to point to something solid. I speak, I tweet; it’s gone. I publish in very forgettable platforms. A book has some staying power. It’s a cultural object, a physical object on which you can focus some attention. What elements of the campaign worked? Baratunde Thurston: We decided to treat this like a political campaign — more about the issues than the politician. We asked ourselves: Can we create a sense of movement that has other people seeing themselves in a book about me? There was a big research phase, talking to people I know or was introduced to, like Gary Vaynerchuk, Deanna Zandt, Eric Ries, Amber Rae at the Domino Project, and Tim Ferris. There were a lot of conversations had and articles read. There’s no excuse to make things up completely or rely on hope. We went with a content-oriented promotion strategy — check out this video or tweet or interview. So, for example, we wound up with 50 short videos that we could build into the book and the campaign. The book’s website was the heart. We posted a daily question every day in February, seeding it with the video I had already shot. For speaking gigs I’d already booked, we asked if we could add book sales. We had field ops — the Street Team. They were the ideal beta group: 115 people, half active and half of those really dedicated. We thought each street team member would equate to sales, but it’s turned out to be more important as a group that lets us test ideas. We also identified the high-value donors — people who are going to deliver a bunch of votes or cash. I went through all my contacts manually, about 4,500 people, and scrubbed that down to about 1,800 real people. I tagged them lightly, looking at them in terms of relevance. And then I started reaching out to them one by one. “Fresh Air” with Terry Gross worked. MSNBC appearances worked. How did the Street Team work out? Baratunde Thurston: We tried to build a very loyal, very intense community. People had to apply. We asked them to participate in web video chats. It was like they made it through basic training. And that was kind of the goal: to have a group of advocates you can deploy in different ways. At launch parties across the country, they help out. Craig crashes on their sofas. They provide a support network; they’re the volunteer fire department. They also became an early-warning system for how the public would interpret the book. They weren’t biased the way the other people close to me were. For instance, during Street Team video chats, they asked questions the public would ask. So I’d go to launch parties and interviews really prepared with answers. This notion of showing the book cover in the hands of people as an image of value — they helped create that. 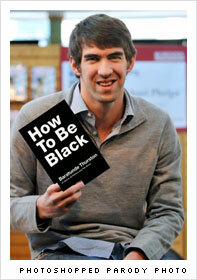 Somebody Photoshopped Michael Phelps holding it, and that was one of first we saw. We seeded that idea with the Street Team, and they ran with it. The Photoshopping became redundant because actual people were holding the book and people were taking their pictures. It turned into a photomeme as people began to post them [to Twitter and the “How To Be Black” website]. We had a roadmap of things we had to do, and one thing we didn’t miss was the Amazon reviews. We wanted to get them up within hours of the book’s availability to set the trend for five-star reviews. We had a video chat with the Street Team right before the Amazon release. Within hours, we had 10 five-star reviews. That signaled to the Amazon buying market that it was a worthwhile book, and the Street Team provided the initial traction. And it’s not just the number of five-star reviews, it’s also how many reviews were helpful or not. We basically created our own Amazon Vine program. What didn’t work the way you expected? Baratunde Thurston: The goal of 20,000 pre-sales didn’t work. Every weekday in February, I should have been doing something for Black History Month. That didn’t quite work, because the lead time for booking events is six months to a year, and we weren’t on top of it early enough. As I mentioned, having the Street Team directly account for a certain number of units distributed didn’t quite work. What role did Craig Cannon play? Baratunde Thurston: I knew Craig loosely at the Onion [where he was graphics editor]. He invited me to lunch to talk about something he was working on, a project with Skillshare. About five or six months before the book launched, we did a class on how to be black. That was a good test for our relationship. We had a huge Google doc with everything laid out. Craig set up the Tumblr, the Facebook page, a private group for the Street Team, the tour support, the admin support. He’s running the merchandise business. The black card — he just went off and built it. I would have been able to do a lot of that worse. Even the two of us are only hitting 60% capacity. We should have had merch ready at launch. At some of our book events, we didn’t have books. For people who don’t have a Craig, the most important thing is the personal one-on-one outreach. Look at the market of people interested in your topic, interested in you. Start with your inner circle. I had an epiphany with Gary Vaynerchuk. I asked: “Did I ever ask you to buy my book?” He said, “Yeah, I bought it yesterday.” I talked about his book, but cash on the table — it didn’t happen. He wished he had identified everyone he knows, sending a personal note explaining: “A) buy the book; B) this means a lot to me. You owe me or I will owe you. Here’s some things you can do to help: If you have speaking opportunities, let me know. For instance, I would love to speak at schools.” Make it easy for people who want to help you. Everything else is bonus. If you haven’t already converted the inner circle, you’ve skipped a critical step. What specific marketing technique would you recommend to other authors? Baratunde Thurston: You can make everything easier by figuring out what value to attach your book to. We’ve been working under the over-arching theme of identity. If you blog every week about why your book is so awesome, nobody cares. If you’re producing relevant, interesting content, they get attached to you in context. That leads to sales. It’s a good model. Once you’ve actually articulated what that value is, make everything else consistent with that. For us, it was comfort with yourself and your identity — everybody has an outsider identity. That provides a roadmap for interviews and events. It establishes the brand and reinforces it. This approach requires time and consideration, but not cash. It’s not just reactive. For instance, this book is about DIY culture that makes the world a better place. With that approach, somebody like my friend Nora Abousteit can get involved, even though race, per se, isn’t her issue. Baratunde Thurston: There was a very important tactical layer, the secret sauce: Knod.es [Note: this is launching to the public soon]. Ron Williams, Knod.es founder, has been an essential shadow. The types of services Knod.es provides — pre-qualified leads — are going to be important for everything. We were sending targeted blasts around and used Knod.es to augment that. The results have been incredible. For example, we wanted people to submit more content to the How To Be Black Tumblr. After launch, it had faded. We recruited 18 people [some from the Street Team] to push a message through Facebook and email. We had a 50% conversion rate on those messages, and got in nine stories without trying that hard. In the same way you approach your network of friends, you can do the same with social networks where you don’t know them as well but they still want to help. You still have to make it easy for people to help you, but finding the value in your existing relationships — that’s incredibly valuable. “The Today Show” isn’t available to everyone.